Will this one act grease the skids for gun confiscation? 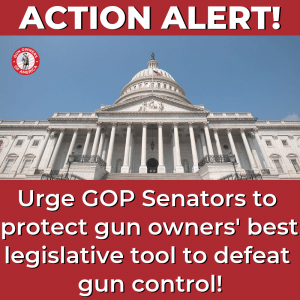 Take Action below to urge your Republican Senator to oppose any effort to weaken one of the most powerful “checks and balances” — given to us by our Founders — which has been used to repeatedly defeat gun control. Gun Owners of America has been around for over 40 years. And in that time, gun owners have succeeded in killing most serious gun control proposals. We’ve defeated gun control after Columbine and after Newtown. We’ve stopped semi-auto bans (in 2000, 2004, and 2013), magazine bans (in 2013), bans on the private sales of firearms (in 2013 and 2019), and gun confiscation (in 2019). If we were to lose this tool, we probably lack the votes to stop most of the Bloomberg anti-gun agenda. And our recent experiences with the federal courts have taught us that we can’t rely on the federal courts to save us from bad legislation. So, it is really alarming that the Senate is considering doing away with the legislative filibuster. And it could happen soon. To be specific: There are two types of filibusters: nomination filibusters and filibusters of legislation (such as gun control legislation). Senator Harry Reid used corrupt and fraudulent tactics to blow a hole in the nomination filibuster in 2013. And, not surprisingly, Republicans extended that precedent in 2017. We predicted, at the time, that it would be hard to hang onto any remnant of the Senate rules once Reid demonstrated that “cheating” reaped political rewards. Yet, up until now, “traditionalists” like Sen. Mitch McConnell have maintained that institutional precedents argue for maintaining the legislative filibuster. And, right now, with about 50 votes for universal background checks and about 50 votes against, the legislative filibuster is the chief barrier against the passage of gun control in the Senate. The “nuclear option” means that McConnell would ignore the rules and simply do what he wanted to do by 50 votes. If he uses the “nuclear option” against a LEGISLATIVE item, there is absolutely nothing to prevent the Democrats from passing gun control by 50 votes — even in a Republican-controlled Senate. We can assure you that, if we aren’t able to FILIBUSTER gun confiscation/red flag legislation, we will probably not be able to stop it in the Senate. And, after it passes the House, can we be sure that Trump would veto it? Especially when he’s said that he supports: “take the gun first, due process second”? Weakening the Senate filibuster would destroy one of the best “checks and balances” that we still have at our disposal. So please take action. You are receiving this email alert because at least one of your senators is a Republican. Contact your Republican Senator(s) and insist that he or she oppose using the “nuclear option” against a resolution on the LEGISLATIVE calendar. Urge them to vote against this, even if it is only shortening the amount of debate after a filibuster is defeated from 30 hours to 2 hours (for nominees).